One of highly respected Indian politicians of the recent times, Sushma Swaraj's journey in the world of politics started at a very young age. She was just 25 when she became the country's youngest Cabinet Minister, and has been a Member of Parliament/legislator for 30 long years now. A six-term MP and three times MLA, Sushma Swaraj of BJP is currently the Leader of Opposition in the Lok Sabha. It is her excellent performance as a politician that has made her the only woman MP who has the 'Outstanding Parliamentarian Award' to her credit. The determined and straightforward politician has firmly stood her ground in the male-dominated Indian political scenario. With the Lok Sabha elections in India just round the corner, Ganesha, with the help of vedic astrology, predicts the future of this powerful politician, who happens to celebrate her birthday on 14th February. Sushma Swaraj is born with Sagittarius Ascendant. Venus is Vargottama in the Ascendant. Lord of the 9th House, Sun is aspecting the 9th House. The 10th House Lord, Mercury is placed in 2nd House and its depositor Mars is placed in 11th House of Gain. All these planetary influences make her a strong leader. She has got the political knack to be the front line leader. She possess excellent leadership qualities and is a wonderful orator with a superb command over language. She is currently passing through the Saturn-Venus-Rahu Dasha cycle. The Lord of the 3rd House, Saturn is placed in 10th House of Career. During Jupiter- Venus period, she was sworn in as the Cabinet Minister for Information and Broadcasting with additional charge of the Ministry of Telecommunications from 19 March to 12 October 1998, and became the Chief Minister of Delhi in October 1998. The strong Venus Bhukti bestowed her with grand success in her political career. Once again, she is under the Venus Bhukti. So, she can prove to be a great bet for BJP. She will perform her job in a forceful and decisive manner during the forthcoming general elections. She has a bright future and is likely to win by a very high margin in LS elections 2014. She will be successfully elected with enhanced status as a representative of the people. Transiting Rahu in Virgo from mid July 2014 may bring sudden elevation in her political career. 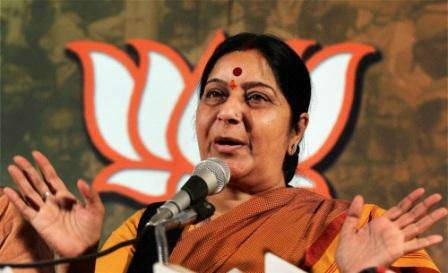 Sushma Swaraj is a well-known politician today because she chose the right career. If your natural talents are aligned with your work portfolio, success is bound to follow. To choose an apt career you need to know your strengths and weaknesses. Find yours at here.